With this business Christmas ecards design, you really feel the pure magic of Christmas! Gold glitter sparkle spectacular! This holiday design really does put your Customers in the mood for Christmas time, giving them a true WOW factor! This beautiful design has exceptional animation and light when playing the card, making it look extremely polished and professional as well as exceptionally pretty this Christmas. 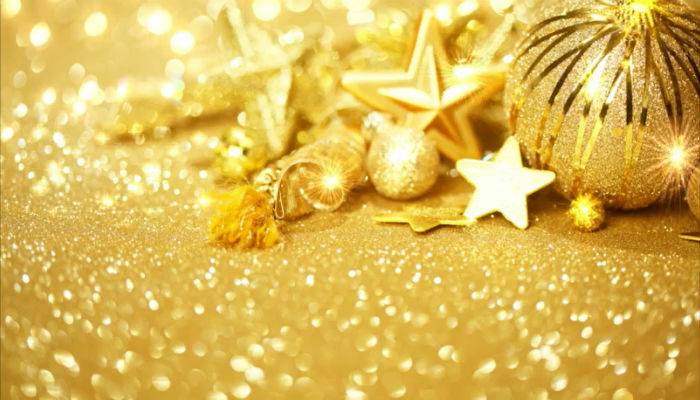 The gold starts glitter and glisten impressively and the bauble gives a real sense of holiday joy. The glittery surface is stunning and as the card plays, this glitter gleams and sparkles on the page, making the Card look truly festive and exciting with a real sense of class. The gold is very sophisticated, also giving the card bags of style. Here at eC02 Greetings we aim for the stars in terms of providing you with the best service and array of truly lovely card designs this Christmas time. Please feel free to browse our exceptional portfolio of corporate holiday ecards for business. Why not register an account with us today and see how the cards really do come to life. The holiday ecards for business have a really personal touch to your customers, especially if adding a company logo and uploading signatures onto the card. Please feel free to contact us and we will help you to do this whilst designing your e cards.